ELEMNT BOLT GPS Bike Computer is rated 4.5 out of 5 by 512. 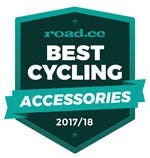 Wahoo worked with world renowned aerodynamic cycling expert Dimitris Katsanis to design the most optimum bike computer for its size. Designed as a system, the ELEMNT BOLT + Integrated Out-Front Mount becomes a CFD tested, highly aerodynamic system that is built to be on the front of your bicycle. The ELEMNT BOLT System comes with a locking screw that riders can use to secure the computer to the mount. When utilized, the ELEMNT BOLT may remain on the bicycle for weigh ins for UCI races. Both ANT+ and Bluetooth capabilities allow you to pair any of your preferred devices and sensors. A truly wireless bike computer, meaning there's no need to tether up to your laptop to sync ride data, download maps, or update the software. Everything can be uploaded via WiFi, Bluetooth, or ANT+. Integrated GPS with a simple, crisp map view preloaded with hundreds of miles of bike friendly routes. The free ELEMNT companion app allows you to set-up customized profiles, track performance, and share ride data effortlessly. ELEMNT BOLT comes pre-loaded with maps of North America, Europe, Asia, Oceania, and South America. Maps for Russia, Asia, and Africa can be downloaded over WiFi. Once synced with your favorite compatible accounts (Strava, Ride With GPS, Best Bike Split, Komoot), your saved routes will be automatically & wirelessly downloaded to the ELEMNT. After a ride, you are able send your data from ELEMNT BOLT to your account with just one click. Using the ELEMNT companion app, enter a destination, address, or point of interest and to generate a route optimized for cycling, complete with turn-by-turn navigation cues on demand, and send the route to the ELEMNT BOLT via Bluetooth. Either on the ELEMNT BOLT or in the companion app, choose this option for the ELEMNT BOLT will draw a breadcrumb trail on the maps page to ride back the way you came. All the magic of WiFi route syncing can now be done over Bluetooth! Automatically send any route to your ELEMNT BOLT with only your smartphone. Use the ELEMNT BOLT to control KICKR or KICKR SNAP in three different modes - level mode, ERG mode, and routes & ride history mode - to maximize your training. In route & ride History the ELEMNT BOLT controls the KICKR to automatically change resistance to match the elevation profile of your route..
Use the ELEMNT BOLT to control non-Wahoo smart trainers that are equipped with ANT+ FE-C.
TrainingPeaks and Today’s Plan are fully integrated with ELEMNT BOLT. Now you are able to see your training plan, execute structured workouts, and send data back to the apps automatically. Ride your workout plan outdoors or indoors. On a KICKR Smart Trainer, the KICKR will automatically change resistance to match the target power of each interval so you get the most out of your structured workout. ELEMNT BOLT comes preloaded with five structured workouts for you to do indoors or outdoors - two FTP tests and three Team Sky structured workouts designed by the team coaches. ELEMNT BOLT displays a visual and numerical indication of what front and rear gears you are in as well as how much gear shifting battery remains. The ELEMNT BOLT works with Shimano Dura Ace Di2, SRAM eTAP, FSA WE, and Campagnolo EPS, electronic shifting systems. Di2 also adds ELEMNT BOLT control with "hood" buttons that allows you to use your thumbs to change pages on your ELEMNT BOLT, hit the lap button, and zoom in and out of data fields without ever taking your hands off the handlebars. Note: Di2 support requires Shimano D-Fly wireless transmitter. ELEMNT BOLT fully integrates with Strava Live Segments to give you accurate progress status and the Final Push to crush your goals. You can also track your Strava Suffer Score Live during your workout, which measures how hard you try and is based on the time you spend in different heart rate zones compared with your maximum heart rate. Learn more about how the ELEMNT BOLT and Strava work together. Rated 5 out of 5 by backdoc350 from Very Pleased I have been using this for the past few weeks. Very user friendly. Great battery life. Way better than my Garmin. Rated 5 out of 5 by Kate123 from Works Great! I love the Bolt! I am not a tech savy person and even I was able to figure out how to work this little gadget. It was really easy to get up and running and easy to navigate while on the bike. love it! Rated 5 out of 5 by MTBDean from Ver impressed Really pleased and impressed with the Element Bolt. Clear display that can be see in any light. LED lights work well. Turn-by-turn works well with the right app, but is displayed quite small, and I cant find a way to make it bigger at the moment. Alround better than my Garmin! Rated 5 out of 5 by Ebernotas8 from Features keep on surprising to reveal potential Really really like it!!! New perspective on how this tool can optimize my riding while not taking away from what I know from past computers. LED lights are an awesome addition. Wish they were brighter bc they are a so helpful!! Wish the mounts were compatible with Garmin and not needing an adapter to change the aero benefits of the mount computer package. Rated 5 out of 5 by ZDGM from Really really happy! Just breaking in this computer after years of using an unnamed competitor. Who knew it could be this simple, this easy and this reliable out of the box? Having being very used to a different system I was scared it would be months till I had a handle on the features but, I reckon I've already cracked it three weeks in. The battery life is fantastic, the link up with satellites fast, the recording of stats very accurate, particularly impressed with elevation measuring and I am totally happy. I have used the device for 30km training mornings and 260km Audax rides. My friends have been telling me to make the switch for sometime and have had their Elemnt's for ages so I'm confident the thing will last. Never left such an unabashedly positive review for anything. I'm picky as can bel! This is the best cycling computer! That's just it. Rated 5 out of 5 by Jay22 from Computer genius The Bolt is one of the best computers out there and covers all needs for training and and taking things to the next level. Awesome price for a great product. Rated 5 out of 5 by Jakex909 from Great Computer. I’ve had this for a couple months now and it far exceeds what I was expecting. Ease of use is amazing. It works seamlessly with the wahoo app to give you immediate feedback on your performance and improvements. I wish I would have had this computer all along. worth every penny. Rated 5 out of 5 by brlee2 from Great gps/computer I mostly bought this for navigation and speed/distance data. Way more features than I need. I don't have a heart rate monitor, cadence sensor, power meter, or Strava Summit but future compatibility is a good thing. It's very easy to use; the companion app is great. I wish I could get more detail when zoomed out on the map (and maybe there's a way to do this, but I haven't found it yet) so that I could navigate on the fly without having a route programmed in. I like having data when racing and always found more basic computers to be finicky.